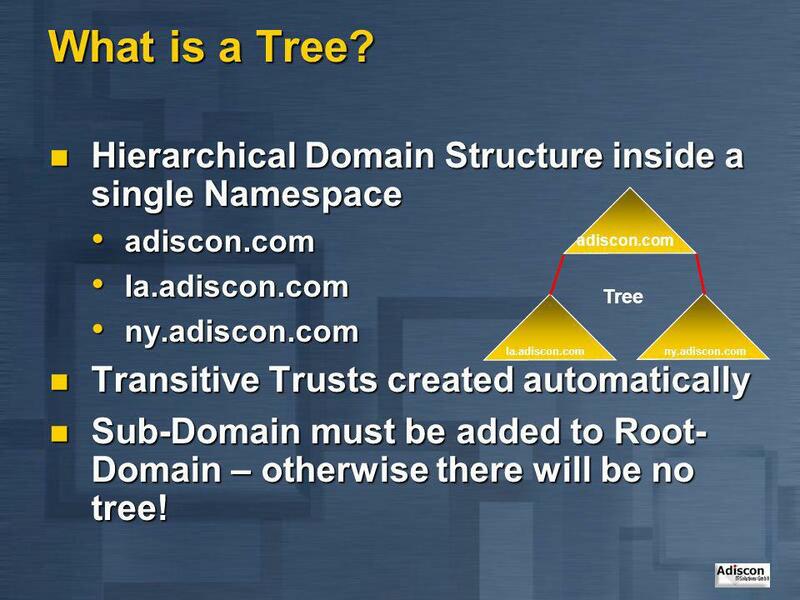 2 What is Active Directory? 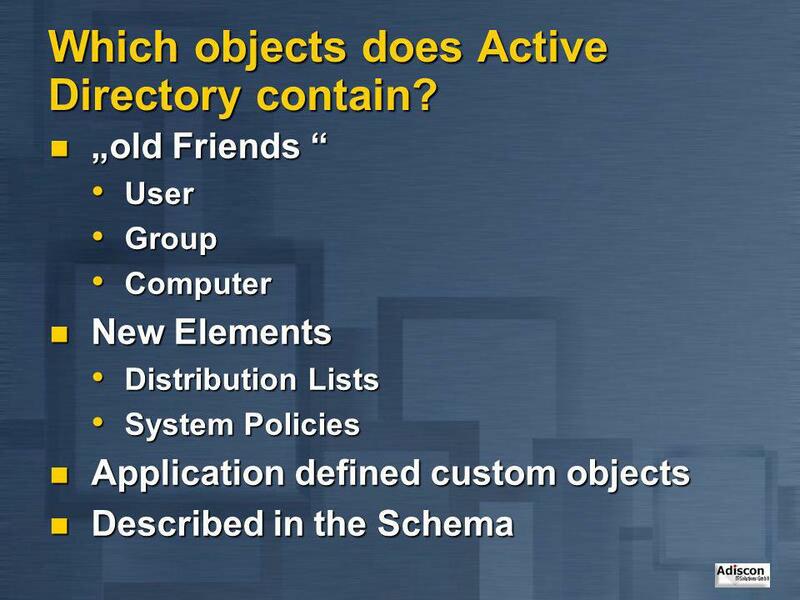 5 Which objects does Active Directory contain? 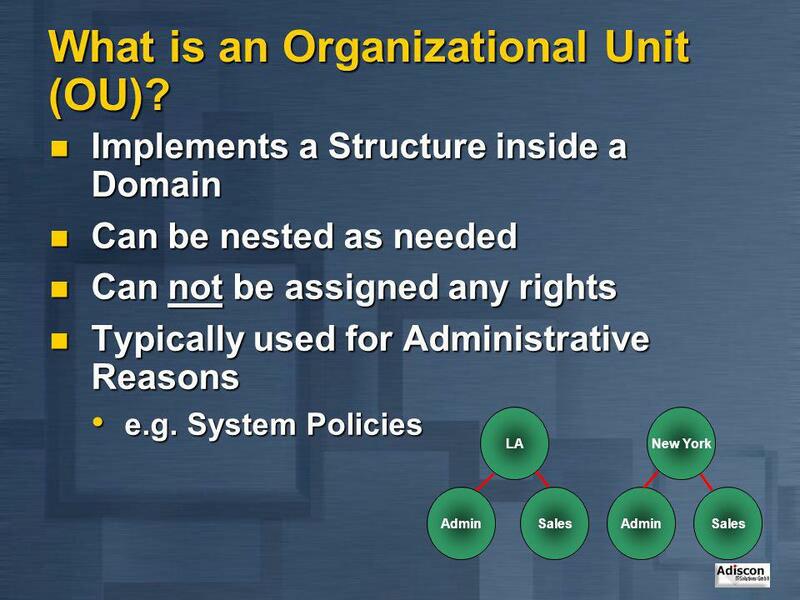 8 What is an Organizational Unit (OU)? 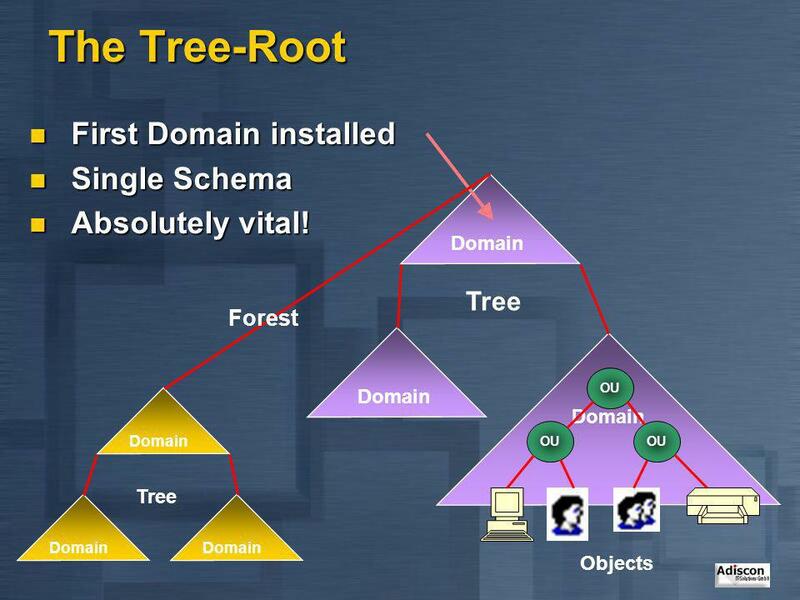 11 The Tree-Root First Domain installed Single Schema Absolutely vital! 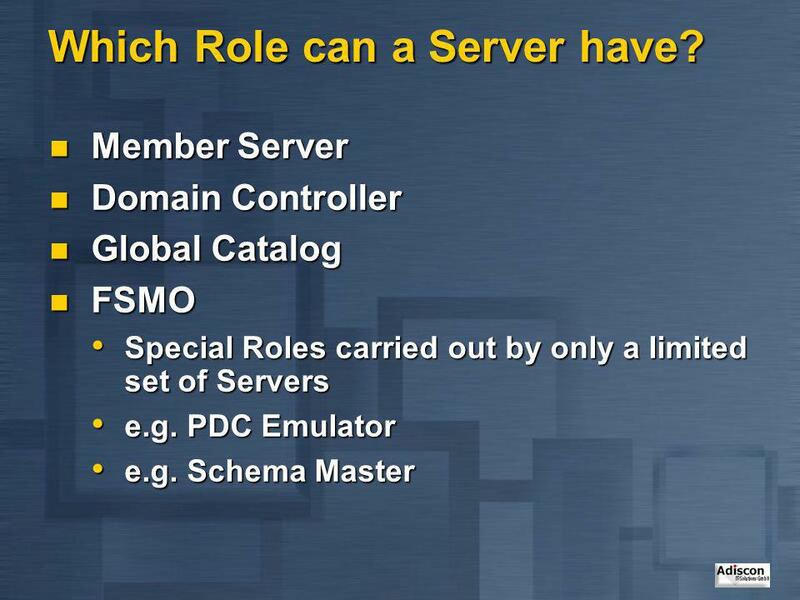 14 Which Role can a Server have? 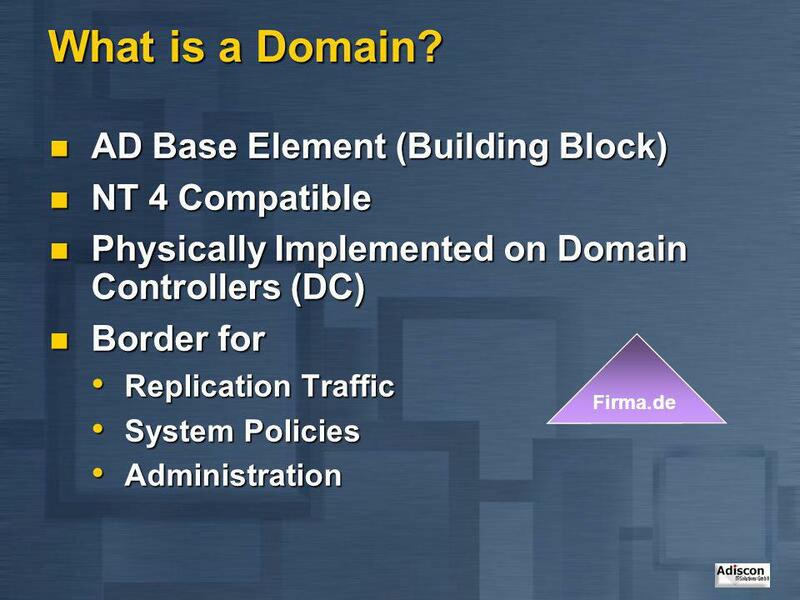 15 What is a Domain-Controller? 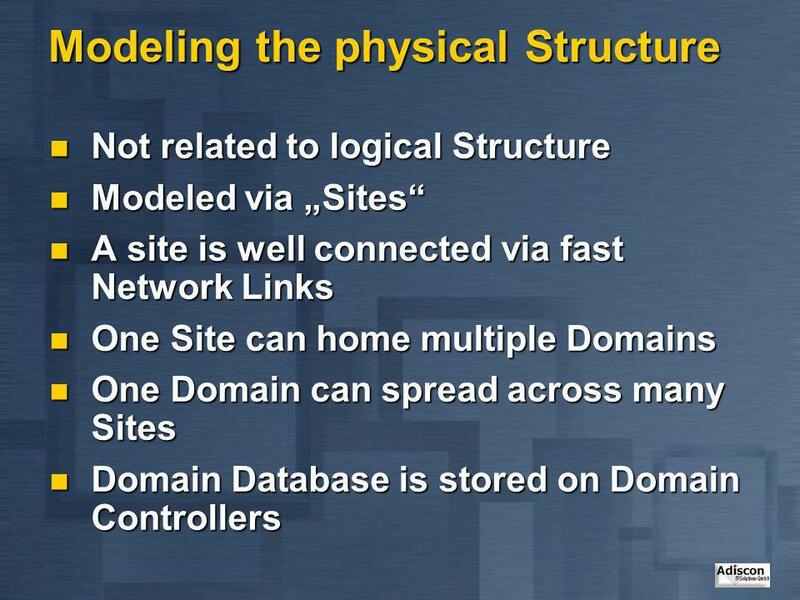 Stores a physical Copy of the Active Directory Database Currently a single Domain per DC supported! 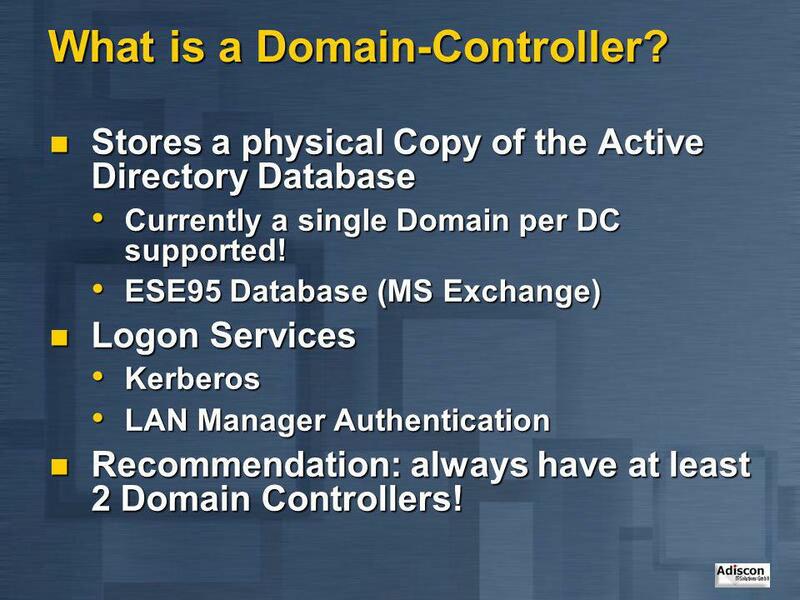 ESE95 Database (MS Exchange) Logon Services Kerberos LAN Manager Authentication Recommendation: always have at least 2 Domain Controllers! 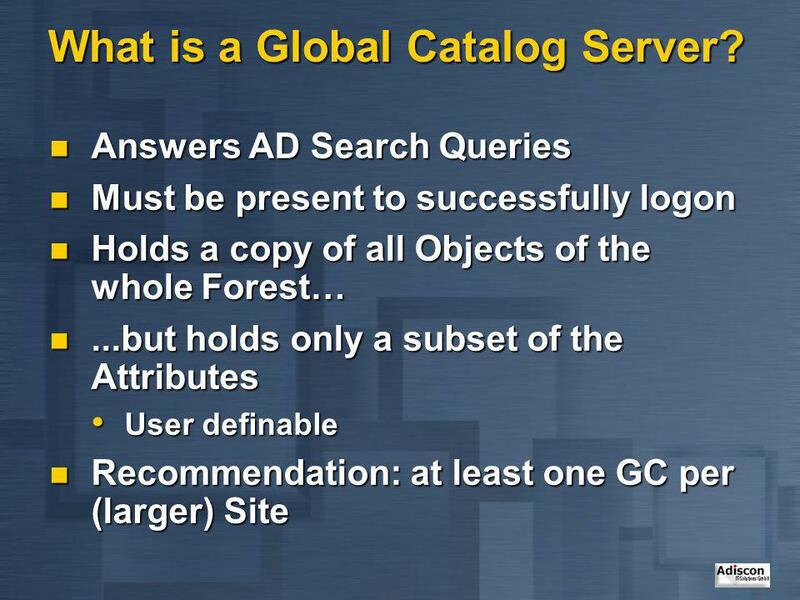 16 What is a Global Catalog Server? 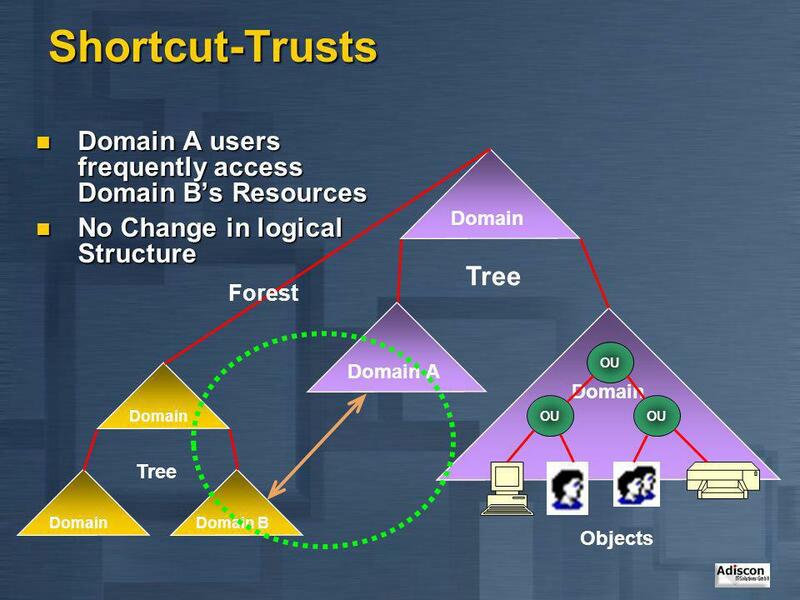 Updates can be applied to ANY Domain Controller Will be Replicated to each other Domain Controls (inside that Domain) within 15 Minutes Optimized Algorithm reduces Replication Traffic Not time based (triggered on demand, only)! 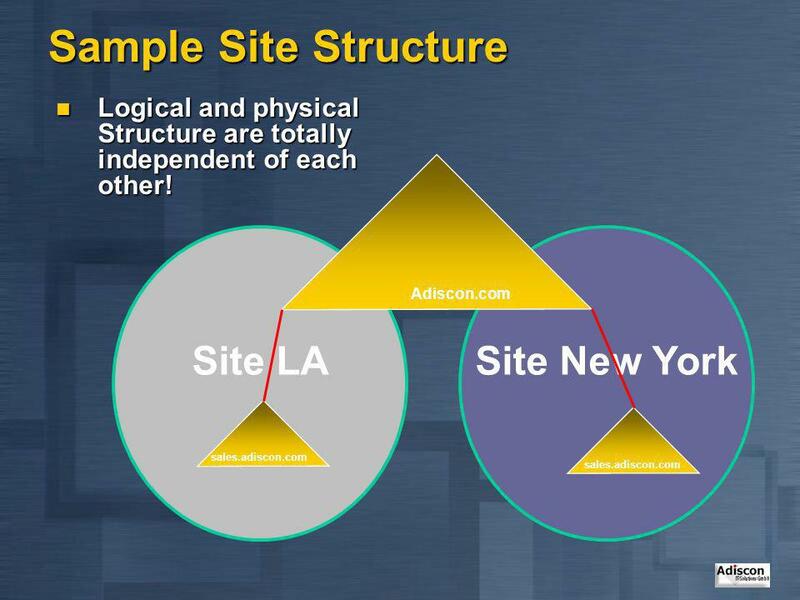 All Domain Databases involved Changes are transmitted compressed via IP (RPC) or SMTP SMTP not within a single domain! 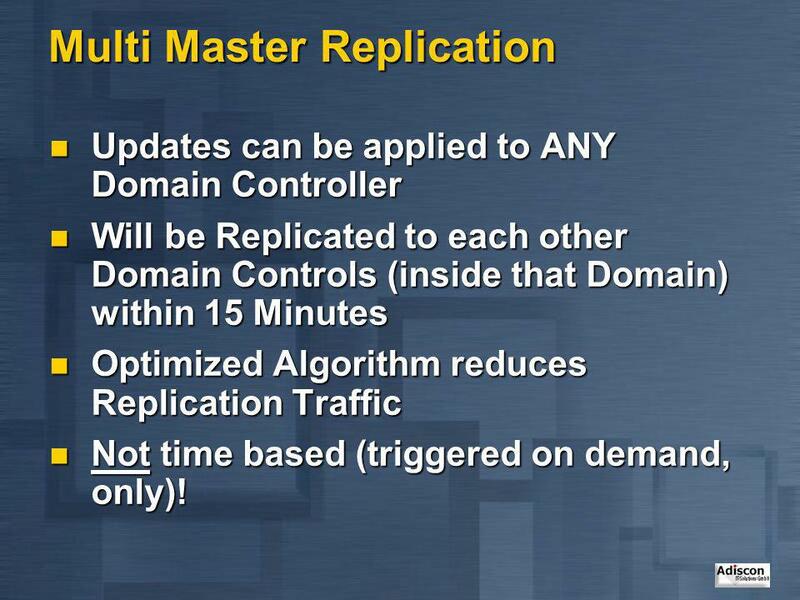 Time Replication occurs can be configured Volume of Replication Traffic can not be restricted! 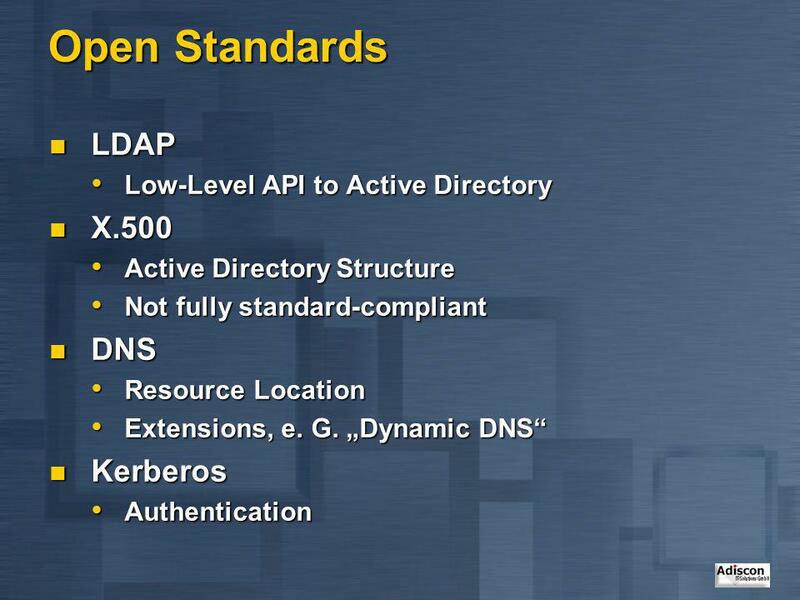 Have an Eye on GCs! 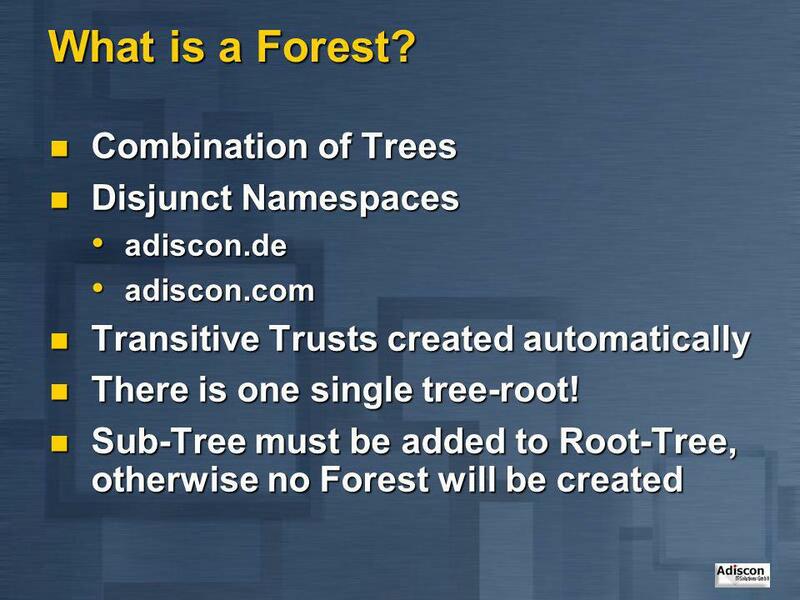 Default NT 4 BDCs continue to work Enables “Fallback Scenario” during Migration Only Native Mode supports all AD Features More than 40 MB Domain Database Size Mostly problem-free „MoveTree“ Universal Groups, Group nesting Once you have switched to Native Mode, there is no way back to Mixed Mode! 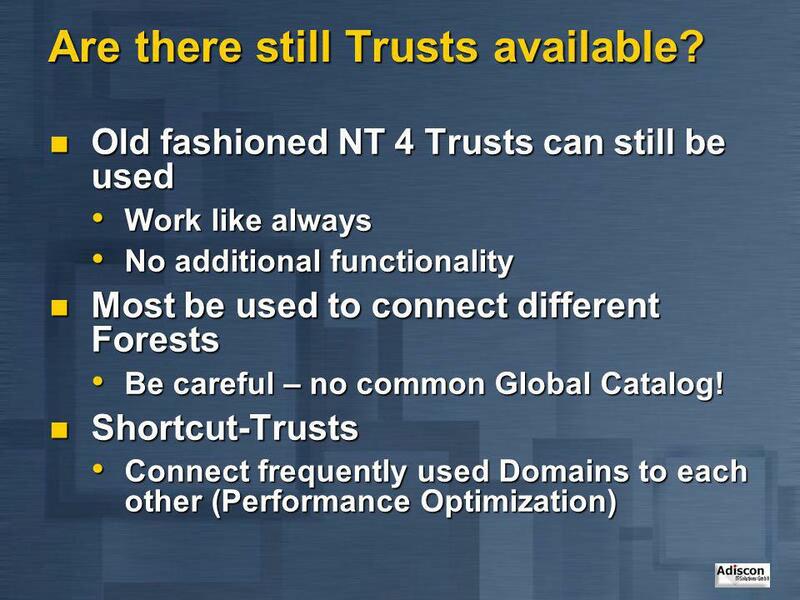 20 Are there still Trusts available? 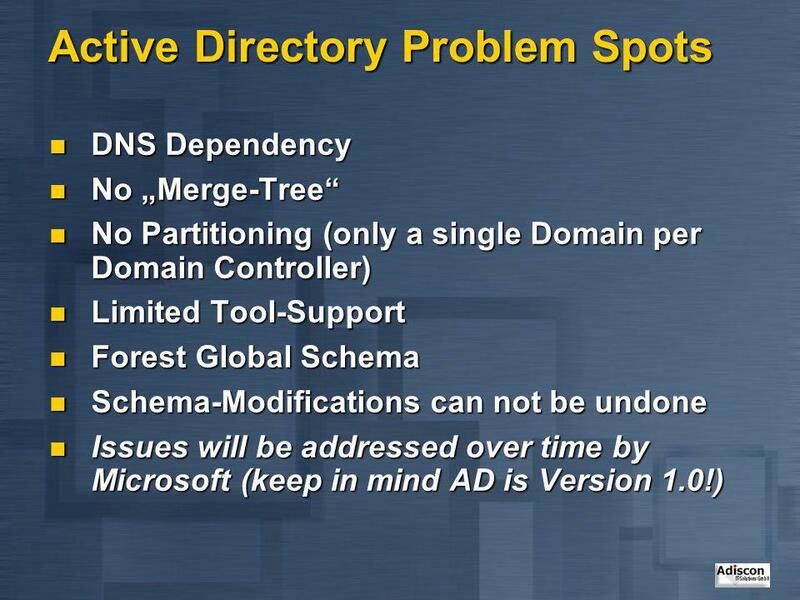 Without correctly configured DNS no working Active Directory! 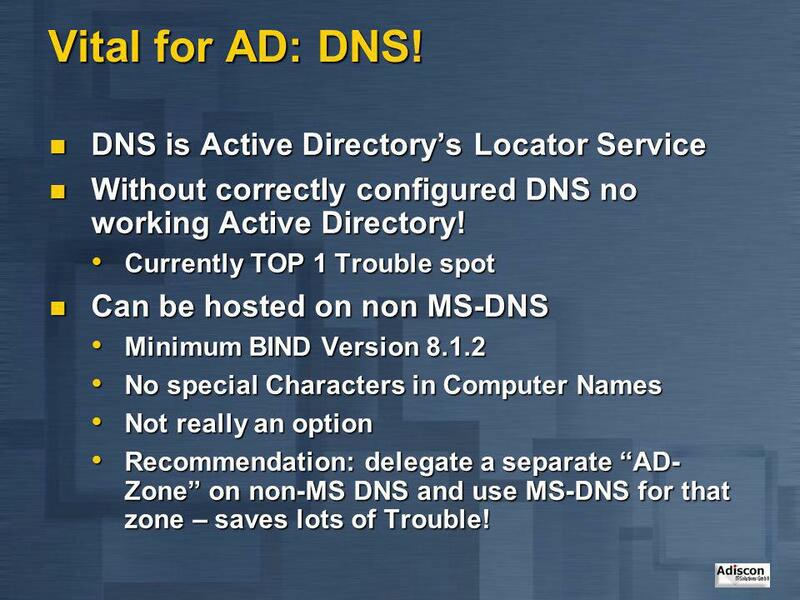 Currently TOP 1 Trouble spot Can be hosted on non MS-DNS Minimum BIND Version 8.1.2 No special Characters in Computer Names Not really an option Recommendation: delegate a separate “AD-Zone” on non-MS DNS and use MS-DNS for that zone – saves lots of Trouble! 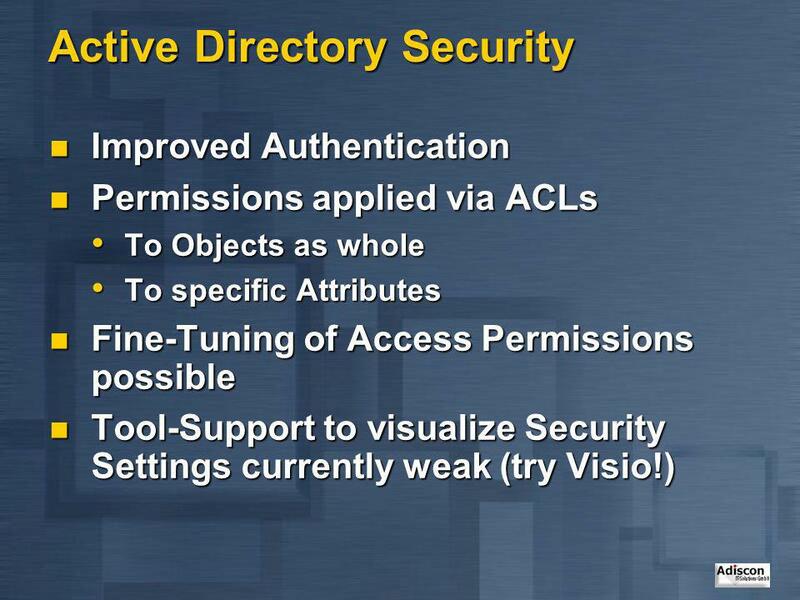 23 Who is using Active Directory? 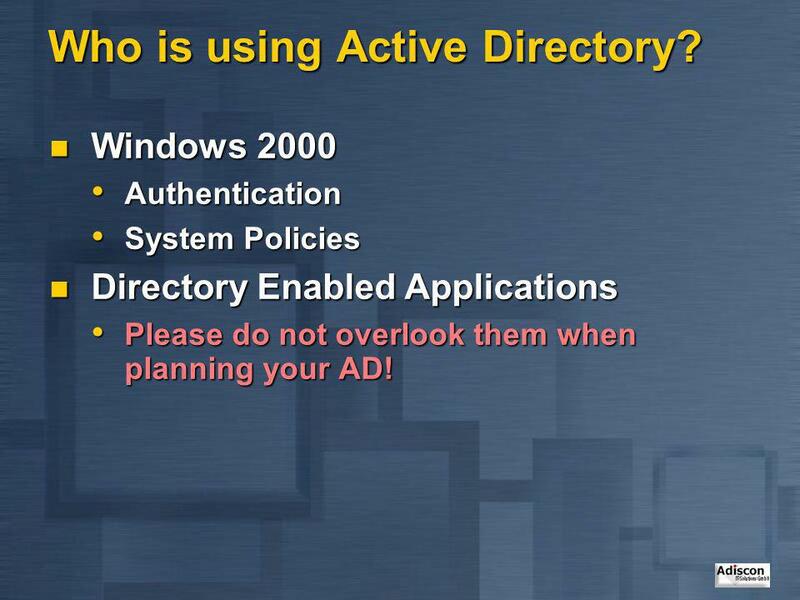 Windows 2000 Authentication System Policies Directory Enabled Applications Please do not overlook them when planning your AD! 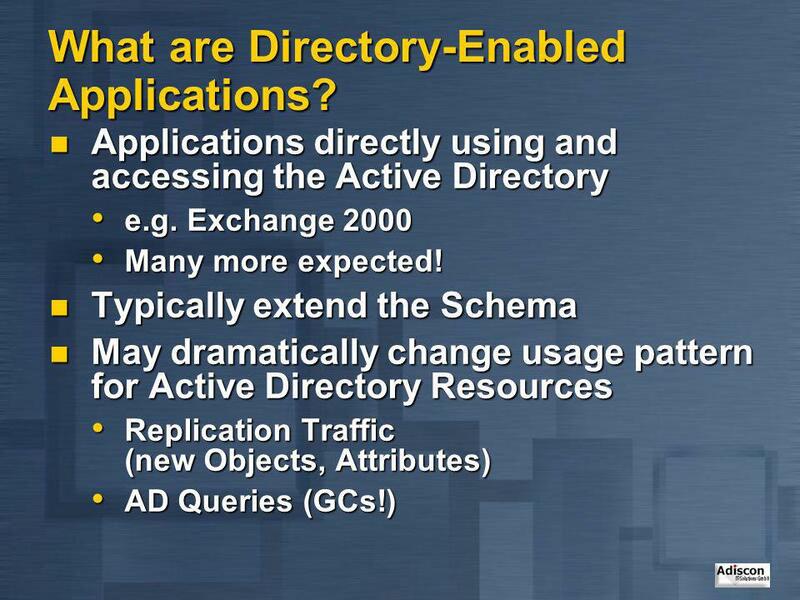 24 What are Directory-Enabled Applications? 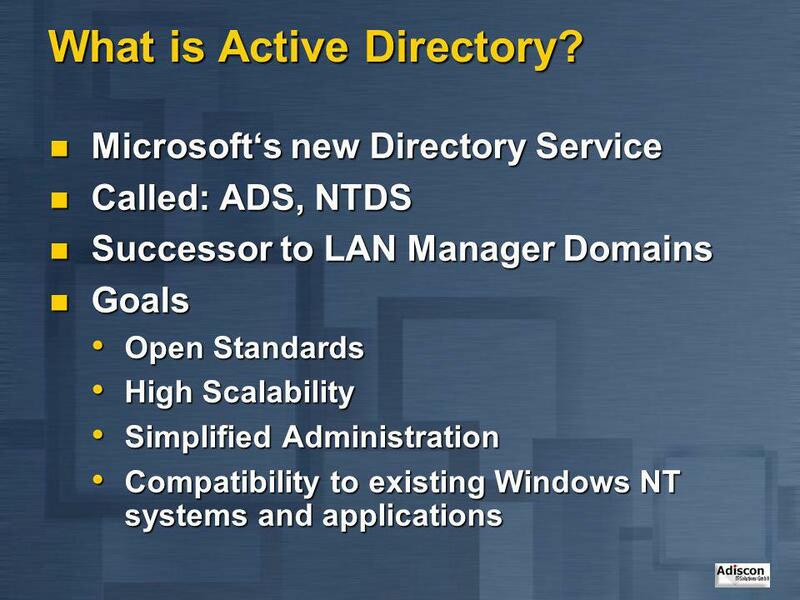 Download ppt "Microsoft Active Directory"
COMP091 OS1 Active Directory. 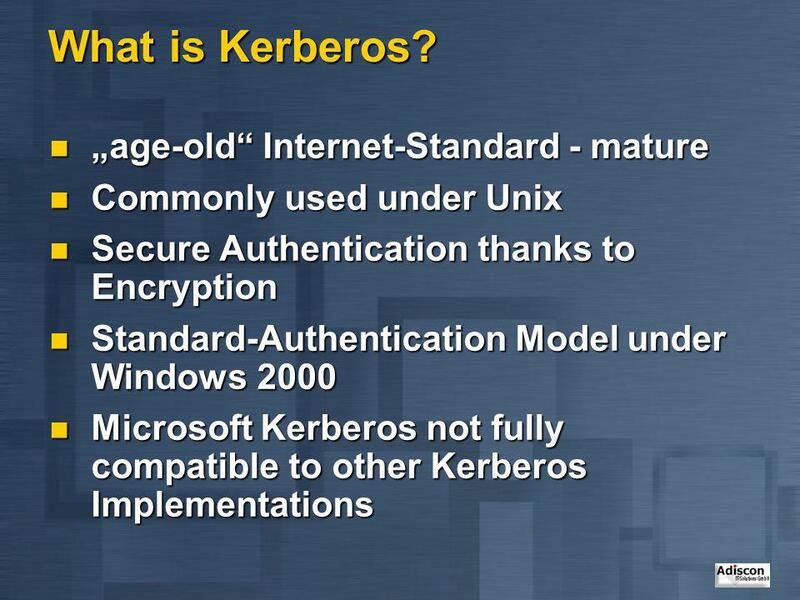 Some History Early 1990s Windows for Workgroups introduced peer-to-peer networking based on SMB over netbios (tcp/ip still. 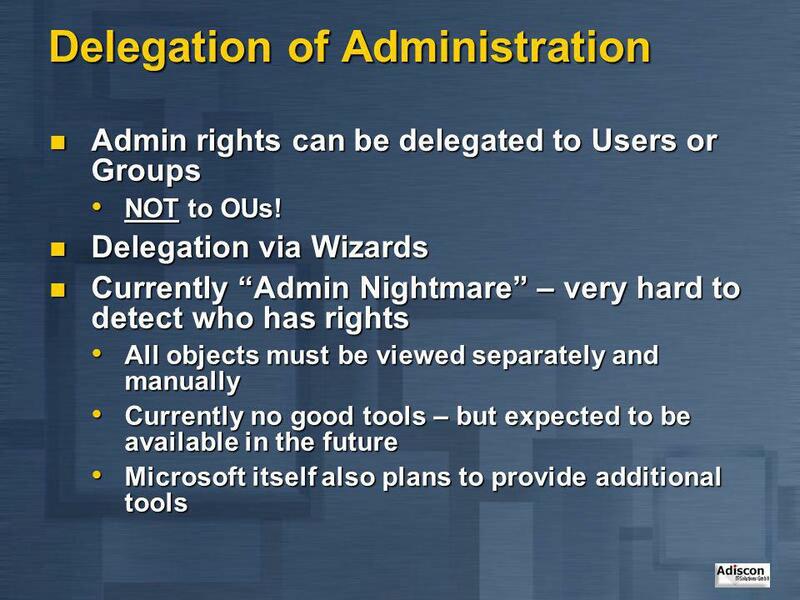 How to Succeed with Active Directory Robert Williams, PhD CEO Secure Logistix Corporation. 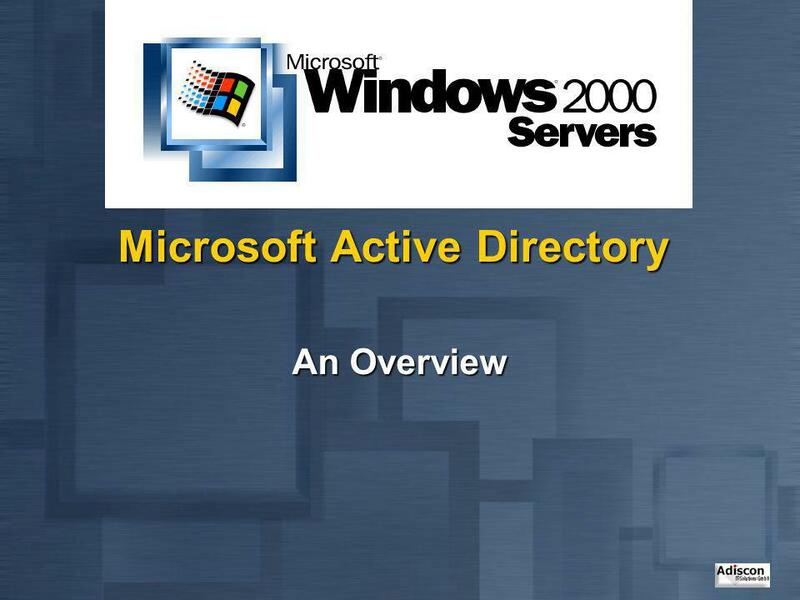 70-294: MCSE Guide to Microsoft Windows Server 2003 Active Directory, Enhanced Chapter 1: Introduction to Active Directory. 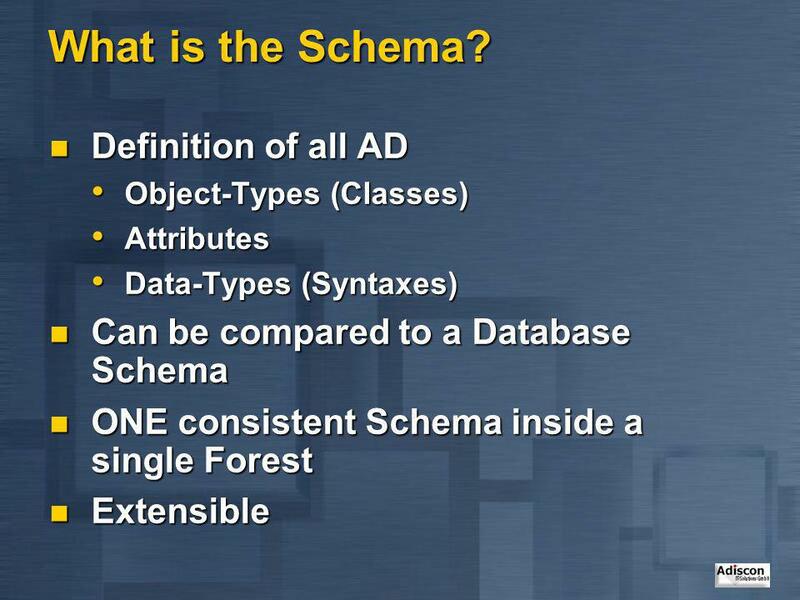 Chapter 4 Chapter 4: Planning the Active Directory and Security. 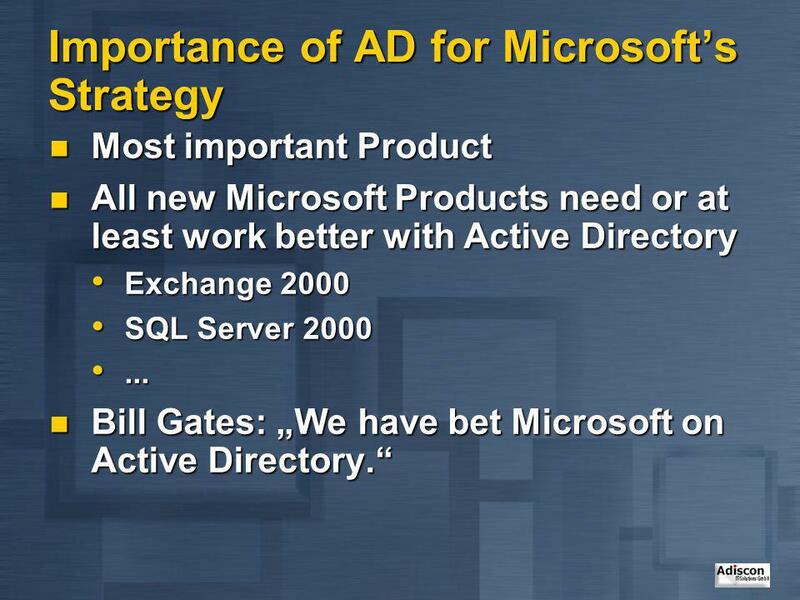 CS603 Active Directory February 1, 2001. 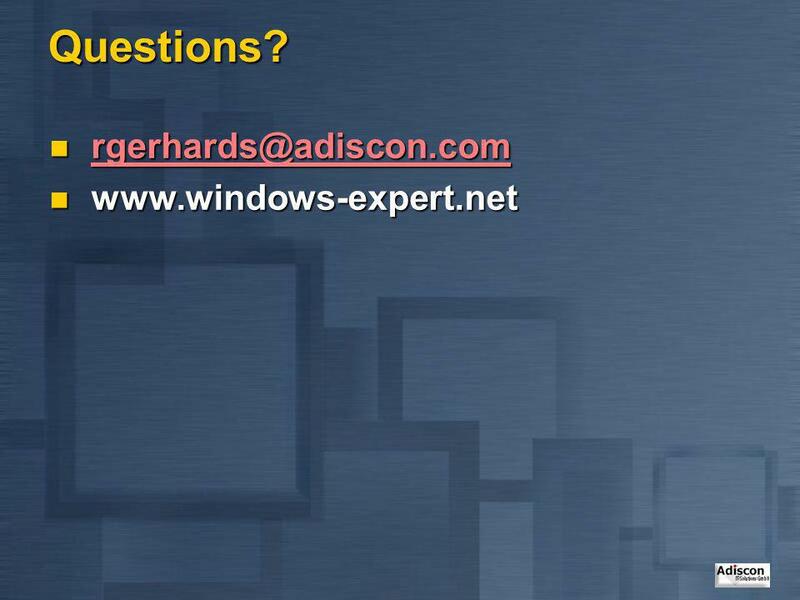 Windows Server WHAT IS ACTIVE DIRECTORY? 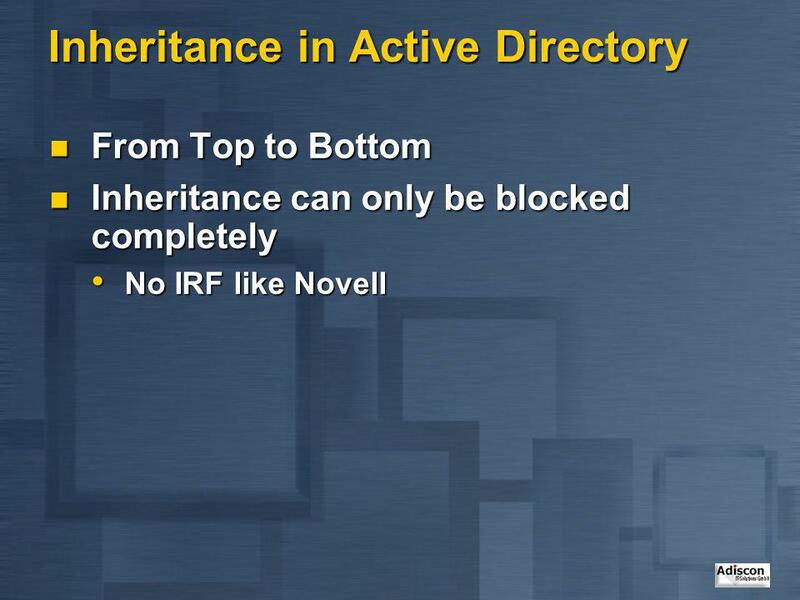 FUNDAMENTALS OF THE ACTIVE DIRECTORY – Benefits of Using the Active Directory in an Enterprise Environment. By Karan Oberoi. 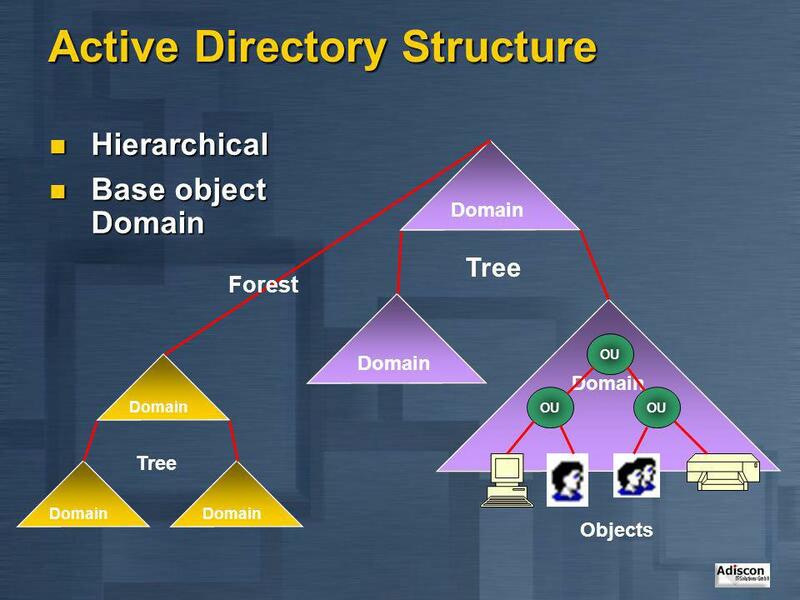  A directory service (DS) is a software application- or a set of applications - that stores and organizes information about a computer.